A politically-loaded experiment involving a man walking through central Moscow with a replica of an AK-74 assault rifle has hit the Russian blogs. Not a single police officer reportedly stopped or questioned him. 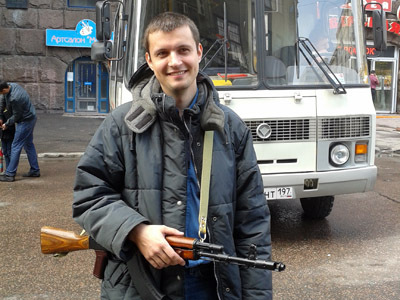 Pavel Tarasov, apparently armed with an openly displayed automatic weapon, strolled through central Moscow, while Vadim Tsibankov took photos of him standing right next to police officers. Vadim describes the experience in a report which is currently top of the Russian blogosphere. The experiment came on a day of increased security force presence in the Russian capital. 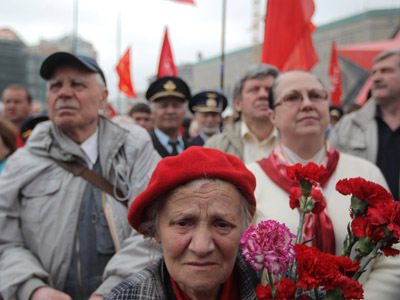 There were two reasons for this: the celebration of Victory Day in Russia, and mass opposition action, which came into its fourth day on Wednesday. Protesters with white ribbons were out to express anger following violent clashes between opposition demonstrators and riot police on May 6, which saw dozens of activists and police officers injured. Many witnesses were outraged by what they saw as unjustified police brutality in targeting the demonstration. Over the next few days, opposition leaders encouraged their supporters to show up in Moscow’s center and walk around wearing white ribbons – the symbol of the anti-government movement – by way of peaceful non-resistant protest. 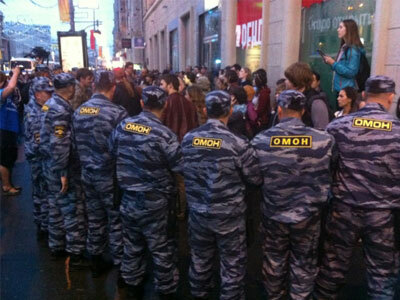 Moscow authorities treated these “public promenades” as unsanctioned political gatherings, and demanded that people dispersed. Over the last few days, dozens of protesters were briefly detained as police circled the city, trying to stop the low-key action. On Wednesday, tensions in the chaotic cat-and-mouse game were further aggravated by the celebrations of Victory Day. "My conclusion is that the police is more interested in rooting out political protest instead of carrying out its direct responsiblities. 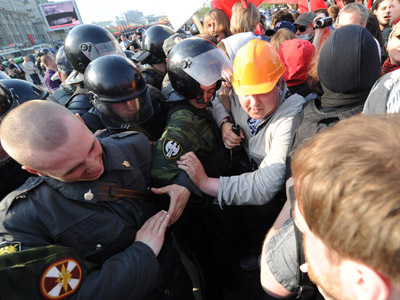 And that is not the fault of the police, but the people in charge of the country," Tarasov told RT.